I have been trying to wear more lipstick lately but it always seems to be the thing I forget when I am running out the door. I finally remembered to today and wore this bright pink color making a bold statement. 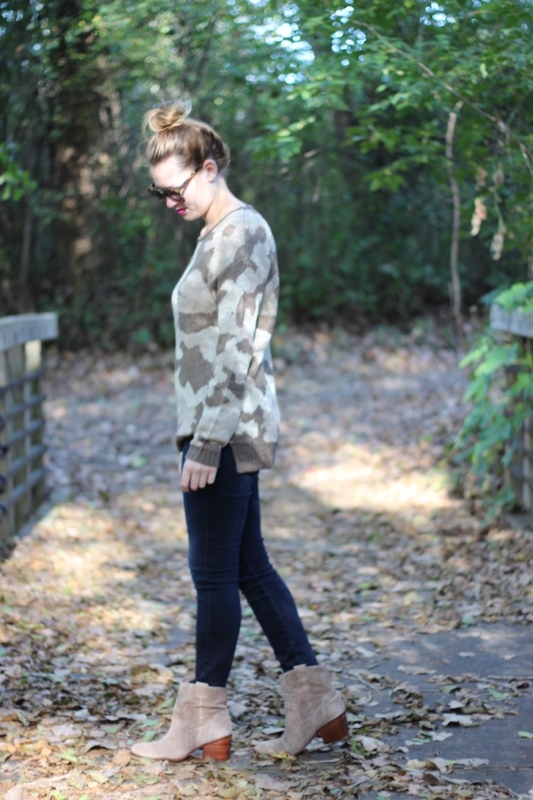 I adore this sweater which is almost a camo print from Elan International sold on the PB&J site. It is super soft and I love how it has a feminine touch with the sparkles that are woven throughout the sweater. I cannot wait to layer this sweater in the colder months with a vest or a cute button down underneath. Even though today was chilly especially with the wind, it wasn't quite vest weather yet, but I am waiting patiently. Yesterday was Eric's birthday and it was so fun celebrating with him! I always have a hard time finding the perfect gift since I feel like I have used up all my good ideas already so I just replaced his cracked Iphone screen and got him some snacks...he seriously was so sad when he cracked his brand new replacement phone that he just had gotten two weeks earlier. This kid need a screen protector and case fast! Happy Thursday everyone! Pretty photos!! You look lovely! !